I don't get to do many online crops. It seems like I'm not able to be online much during the time that sites usually have them. I am fairly active at The Scrapbook Site though, and wanted to be sure to participate in their online crop on National Scrapbooking Day. 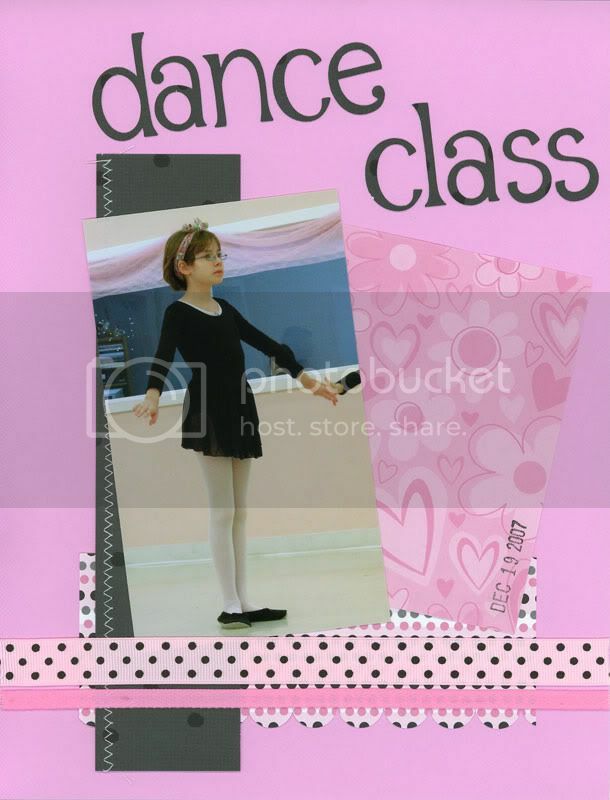 They had several classes and challenges and I even won a craft organizer! yay! Anyway I didn't get as much done as some of the other people (I almost typed ladies but there is one man that posts there). So anyway these are some of the things I made. To see the scrapbook pages bigger click on the picture. This was a class project. 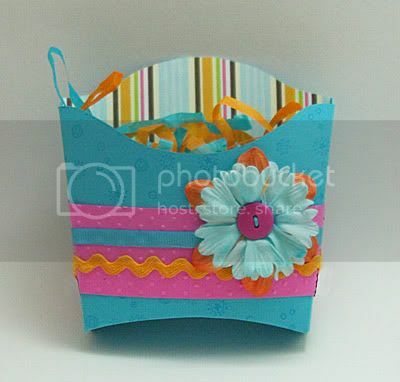 I used Stampin Up cardstock for the box and band, and my Cuttlebug swiss dots embossing folder on the band. The stamp on the box is Sprinkles from SU and the ink is also from SU. The patterned paper is from Rob and Bob studios. The flowers are from Prima and the button is from Oriental Trading. The rick rack is from Doodlebug. I don't know where the blue ribbon is from. I think it turned out kinda cute. This was for a sketch challenge. We were given a sketch to follow and I followed it pretty closely. 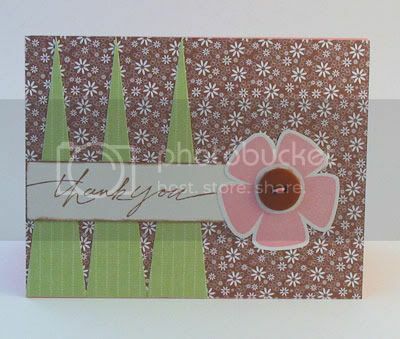 The green cardstock is from Bazzill and the pink is from Stampin Up. The patterned paper is KI Memories. Both ribbons are from American Crafts. I'm not sure where the D ring was from. I did the letters on my cricut using the Zooballoo cartridge. In the bottom picture she is biting her own leg. The next was a scraplift challenge. We were shown a layout and we were supposed to make a layout using it for inspiration. Cardstock is Bazzill. The black patterned paper is from Lasting Impressions and the pink and spotted is from Rob and Bob Studios. I don't know who made the ribbon. The letters were cut using the cricut and the Alphalicious cartridge. This card was from a sketch challenge. Not even close to what I normally do but it was fun anyway. Everything is from Stampin Up except the pink ink, which is Brilliance, and the button which is from Oriental Trading. Love the layouts! 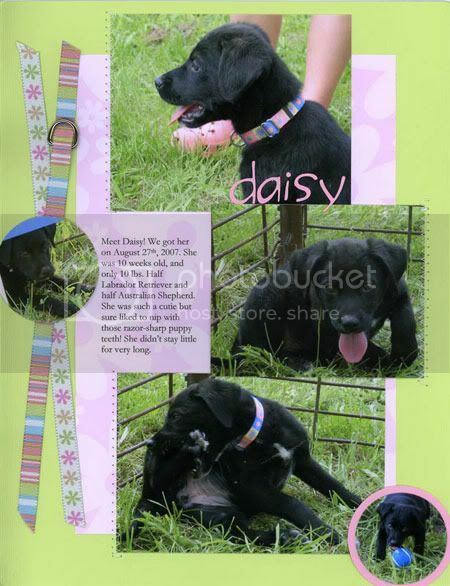 Especially the one for daisy!